Designed by Giorgetto Giugiaro, this car is very much the looker with aggression thrown along with conservationism. From the front, the single chrome grille with a horizontal bar thrown across with the Chevy bowtie doesn’t look that alluring now as it was 4 years back. The old fashioned head lamps flanking the grille are big but then frankly speaking, after having gone through so many car designs with my stint at Indiandrives, I think that the Chevrolet Aveo in India looks very conservative now. The bonnet is also steeply raked. The air dam is split into three units and only the middle unit has that typical air dam look whereas the split ones are covered by plastic claddings with the fog lamps been embedded in them. 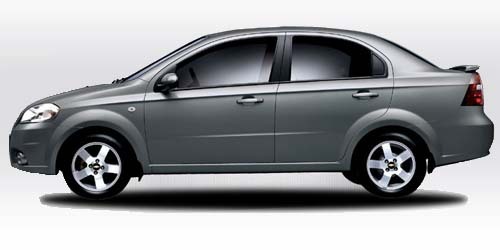 The Chevrolet Aveo in India is available with steel as well as alloy wheels. The particular model that I had was the one with alloy wheels. The tyre size irrespective of the variant stands at 185/65R 14. The rear portion of the car however still holds one’s attention with its uniquely detailed triangular tail lamps and the chrome bar running across as the trunk opener. There is a rear spoiler with the stop lamp attached to it. I would rather say that this was one of the best angles to view the Aveo from. Also the tail pipe unit looks great unlike some other cars from its segment. Oh, 1 thing that I forgot was that the badging on this car can easily be stolen or erased. The 3 spoke steering wheel and the solid thunk of the doors is what you would first notice when you enter the cabin of the car. 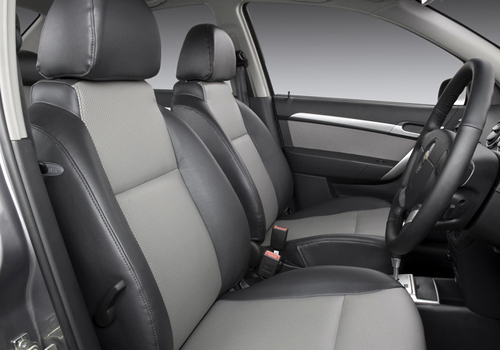 Like its elder brother, the Chevrolet Optra, the Chevrolet Aveo in India also has dual tone interiors. The 4 spoke steering wheel however is devoid of audio controls. The circular AC vents blend well with the smooth flowing dash. The quality of materials used is of very high quality. The fake wood strip running across the length of the dash lends it an upmarket look. The AC(mind you, no climate control) also works very well but then since I am checking it out in winter, I wouldn’t be able to tell if the same car has good AC performance in summer as well. It however does have a 2 DIN integrated audio system which is a cracker. It sounds very good on the move. The front seats are power adjustable as well as the steering wheel. Finding a good driving position wasn’t a chore in atleast this car. There was good space for the front seat passengers including myself. Most of the owners in this segment are chauffer driven(our finance officer is one of those specimens) and so the rear seat was the place I was looking to spend time in. Well, yes, with a central armrest for company and those comfortably inclined seats, the chauffer driven car tag is justified. Leg room was also plenty and this meant that the car doesn’t disappoint even the taller passengers. Boot space is also good at 400 liters and the absence of suspension mount intrusions makes it even more deep. It is a known fact that GM cars in India are tuned more for ride comfort rather than outright handling capabilities. Well, the Chevrolet Aveo is no different. Even though this car has been tuned to be on the firmer side to handle all the road imperfections that the Indian streets may heap on it, it still doesn’t handle that well. The reason for this is the lifeless steering wheel. The steering wheel is light during normal city runs but then it doesn’t weigh up sufficiently once on the open roads. It has that artificial feel(I guessed it would be the moment I saw it). But then the taut chassis does make amends and doesn’t make the Chevrolet Aveo to roll like a boat. It is a composed performer which doesn’t like to be hurried though. The ride quality is firmer but then since it would be chauffer driven(I still am coming to terms with this), with laden weight, the ride is good. If you are the only one driving this car, then watch out for some sharp ruts filtering into the cabin at high speeds. At low speeds, everything seems to be taken in stride by the Chevrolet Aveo in India. Only at the higher speeds does the car exhibit some poke from the road imperfections. That saying high speed stability is commendable for a small sedan. Another thing which deserves mention is the sound proof interiors. Agreed, that there is some engine noise after crossing triple digit speeds but then it isn’t too intrusive. 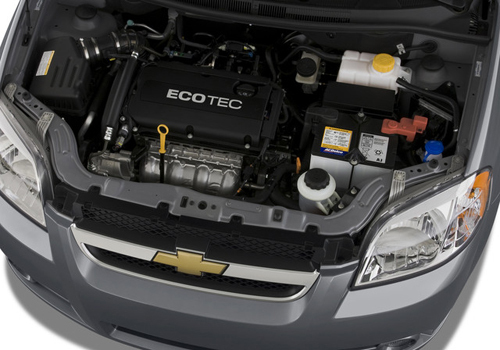 The Chevrolet Aveo in India is offered with two engine trims. One is the 1.4 liter MPFI 4 cylinder petrol engine which produces 94 Ps of power @ 6200 rpm and 128 Nm of torque @ 3500 rpm. The other engine is the same one doing duties in the Chevrolet Optra VGIS, the 1.6 liter unit. It pumps out 102 Ps @ 5800 rpm whereas the torque figure is much higher at 149 Nm(produced at 4000 rpm). Both the engines are mated to a 5 speed manual transmission. The former engine reaches the 0-100 kmph mark in 13.3 seconds and the top speed that it can attain is 173 kmph. The latter engine breaches the 0-100 kmph mark a full one second earlier than the 1.4 liter one. The top speed possible in the 1.6 liter motor is 181 kmph. Both the engines are silent in their operation but then when given the beans, the 1.6 liter one is slightly more vocal in its operation. Both the engine types are reluctant to rev harder. The best thing that they can do is cruise at triple digit speeds all day long. Call for some spirited action and the 5 speed gearbox also plays truant and is reluctant to shift earlier. Lest, I missed out, GM, last year rolled out a CNG version of the 1.4 engine as well. Expect the performance to suffer a bit due to the CNG fuel shift. 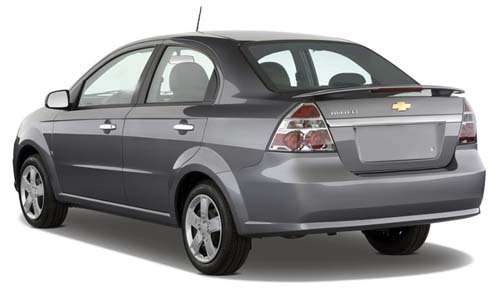 Braking for all the GM cars is confidence inspiring and the Chevrolet Aveo just proves it. The self adjusting drums at the rear and ventilated disc brakes at the front provide both the variants with ample stopping power. Coupled with ABS for the top end variant, it gives excellent and safe retardation. Safety is governed by the tough body shell with ample crumple zones, driver air bag in the top end version, 3 point seat belts for all the occupants and a collapsible steering wheel. Fuel efficiency for the 1.4 liter motor as expected is good with figures of 11.2 kmpl in city and 15.5 kmpl on the highway. The 1.6 liter motor is said to deliver a bit less with 10.4 kmpl on the highway and 14.9 kmpl on the highway. The CNG version(this I have read somewhere) is said to go 150 kms on a tankful. The Chevrolet Aveo in India was a strategic product for General Motors in India. It however failed to deliver the goods for the company. The main thing which can be attributed to this is the lack of brand image and the not so fuel efficient engines. In a country which is obsessed with mileage so much that even a few meters make a big difference in the buying decisions, the Aveo doesn’t cut mustard. The Aveo range may be revamped entirely this year but till then the car will continue to soldier on in India. Partly due to this fact, GM has introduced the CNG version. The best part is that it has got every other quality that a family would be looking for in their first sedan. Space, pace, refinement and good interior quality. The Chevrolet Aveo price in India starts at Rs Rs 6,20,433 and goes all the way upto Rs 7,29,052. All these prices as usual are ex- show room, Delhi. The new Aveo gets a complete makeover including Chevrolet’s two slat grille, larger and more stylish head lamps and a new rear-end. Inside, the dash is all new and so is the upholstery, steering and the instrument panel. bootspace tool has been improved and now offers 370 litres. Previous PostPrevious Is it Peugeot 508 in India?